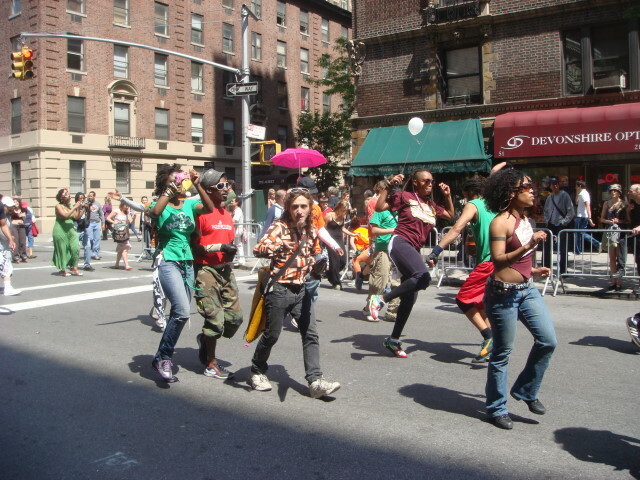 Here’s my third and last post on the 2008 NYC Dance Parade. The next group was something called “Stage Stars”. 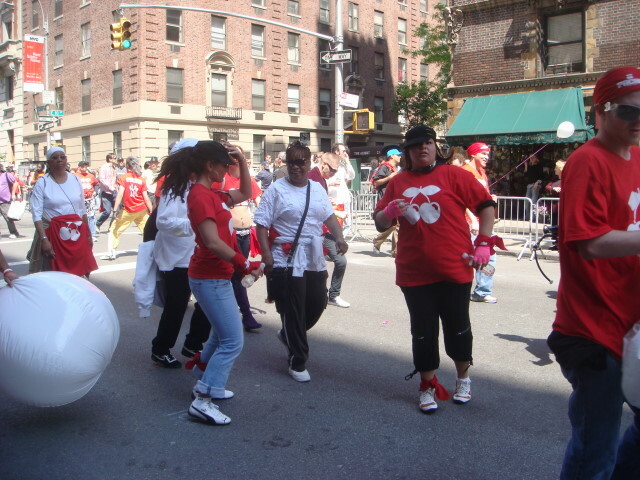 There wasn’t a lot of dancing being done by them at the moment, but I did catch one woman having some fun. 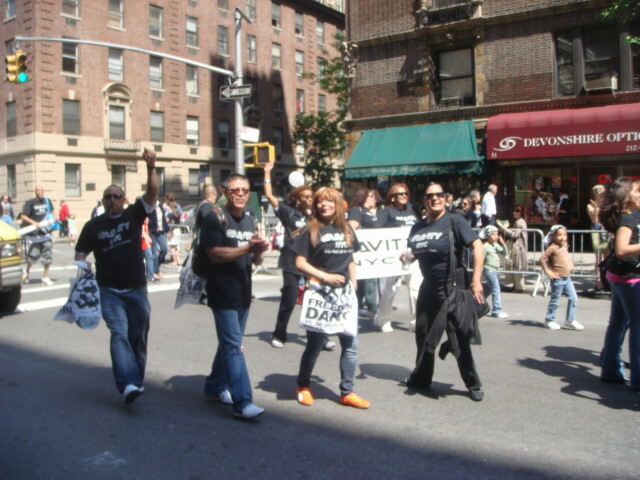 The next group was, at least for me, the most boring group of the entire parade. By far the most boring. And they were probably the only professionals: the Knicks dancers. They didn’t do any routines, they didn’t do anything other than walk and wave. Ladies, it’s a dance parade. Dance. 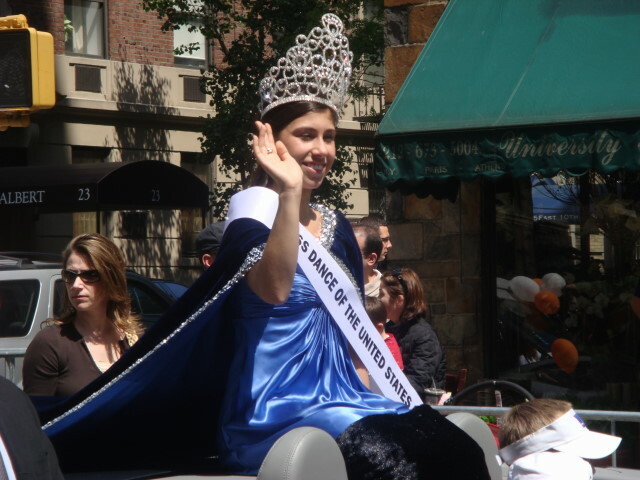 Well, the next group didn’t dance either, but I do love the concept of the beauty queen (just take a look at my Polish Day Parade postings). This is Miss Dance of the United States. I haven’t the foggiest idea of how she got the crown. I presume it is from this source. I hope she gave a nice exhibition at Tompkins Square Park. Maybe the Knicks dancers did, too. And next came the next batch of hula-hoopers. It was great to watch. It’s been a long time since I’ve seen them used and it was too long. The next hula-hooper was great. Thanks for the pose. 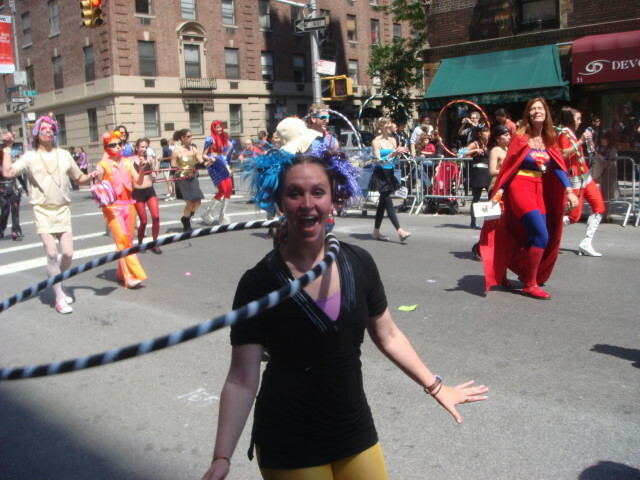 Despite my calling the group “hula-hoopers”, it was actually more of a costumed group. I didn’t see any identification for them at this point. But the costumes had me think that they were frustrated trick or treaters who are waiting for an altogether different parade. The next picture was something of a celebration of the warmer weather, in addition to the costume theme. 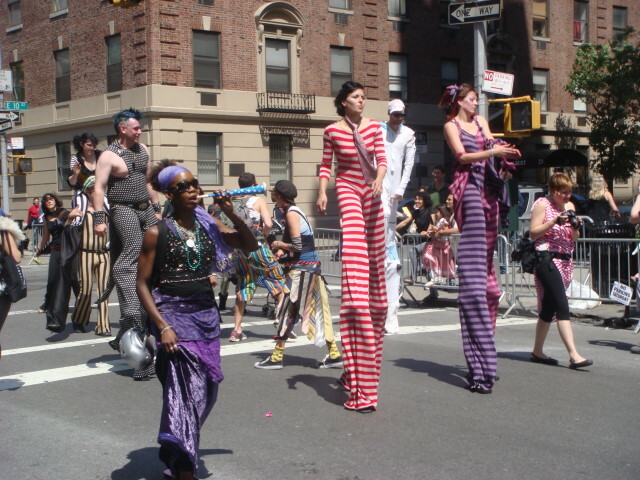 If we’ve got hula-hoops, we gotta have more stilt walkers, too. 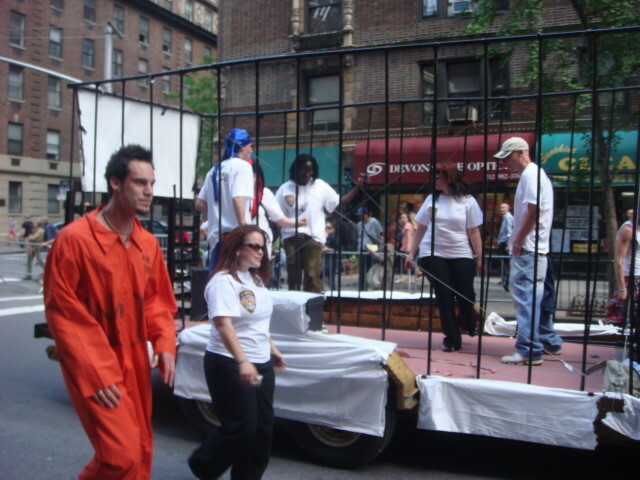 I think it’s one of those immutable laws of parades. This dancer vamped it up to 11. Thank you very much. Other than the guy who was the only one on the block, this next guy was the most exhibitionistic. He got cut off from his group by the cops to let traffic flow through. 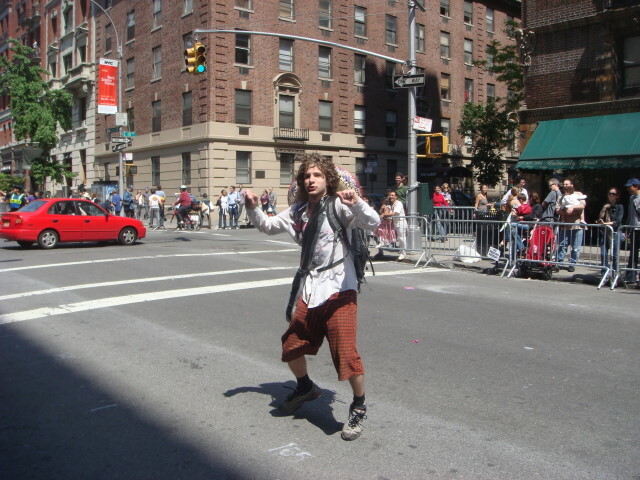 Then he kind of took over from the cops and started directing traffic (getting blasted by horns once or twice). And, fueled by adrenaline (and maybe more), decided to share his enthusiasm with the rest of us as he slowly caught up with his group. These two appeared to be late and were running to catch up, too. I just think of them as Batman and Happy Woman. A group called Dance Studio brought back a little more organization and style. Although this next picture isn’t taken during an action sequence that I remember. These youngsters did a really nice set of dancing with some of the other Dance Studio people. Formality disappeared when the Dance Police showed though. Where were they when the dance criminals from Metropolis in Motion were flagrantly flaunting the no dance laws? 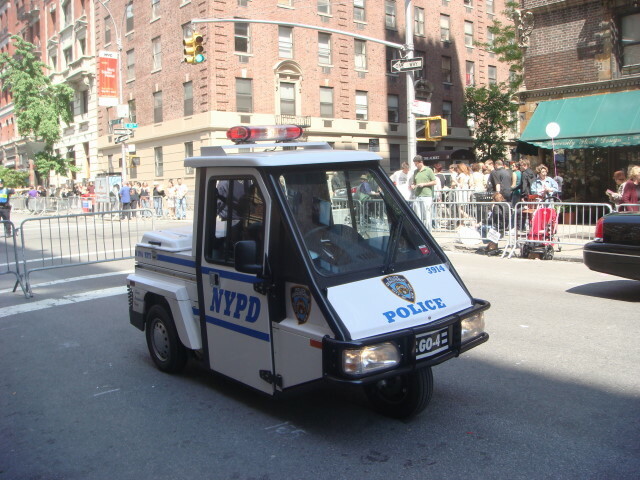 Oh, they aren’t that sort of police? 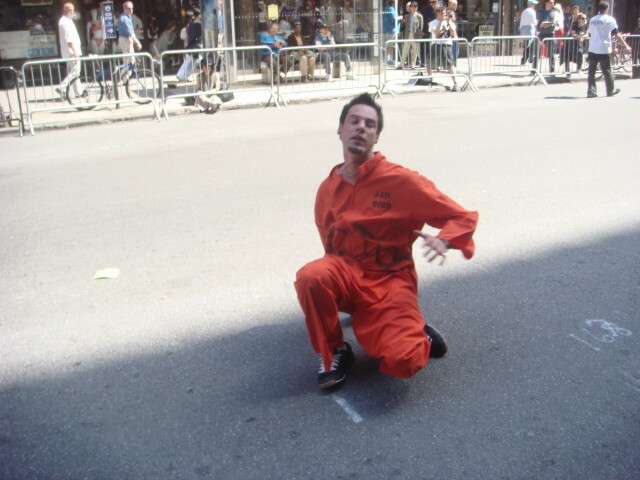 This was the only breakdancing I saw in the parade. This next group came with no sign as to who they are. Middle East or faux Middle East? I don’t know. Finally! 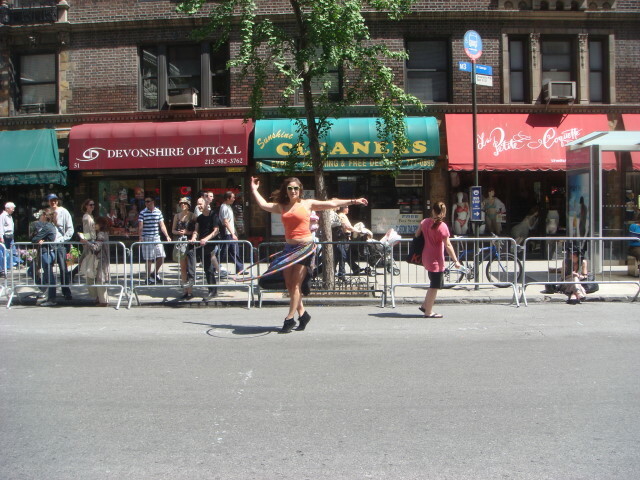 Another hula-hooper. I know you needed another fix. I certainly did. A group called Melting Pot Dancers then showed up. Oh, and they danced. They were a pretty fun group although I was getting a little tired of freestyle and the like. They did have a float, but I really can’t remember any significance to it. The next group was called “Freedom to Dance”. Don’t these people know it’s a crime to dance? Well, I guess they’re prop dancers. I don’t know what that means, if anything. They just used the flags as props. Just how many groups are there in NYC devoted to dance? Lots I know about (because of the parade). This group is called Gravity. They weren’t very somber, so I presume they are acquiesing to the physical process. We must heed gravity. It’s the law! Oh, and they wanted freedom to dance. You know, I didn’t see a single one of the paraders thrown into a (real) jail. I was, and remain, mystified by this next group. I saw the two cherries on their shirts and haven’t been able to figure it out. There has to be a simple reason. 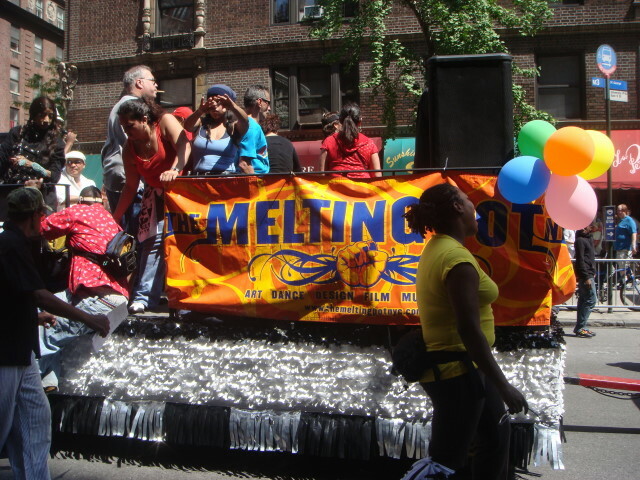 They seemed to be associated with the float below, which had the words “Martinez Brothers” in big letters. The young ladies were celebrating the warmer weather. Yet, not a single smile amongst them. Finally, the cops showed up to arrest the whole lot of them! Okay, not really. It’s just the end of the parade. 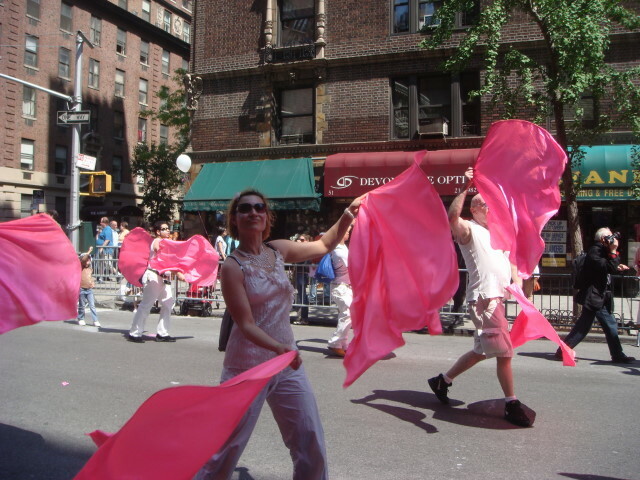 I’ve covered a lot of parades and I generally enjoy them. 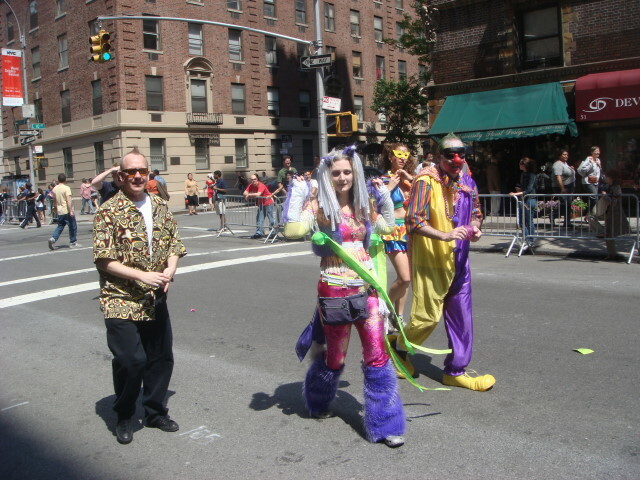 And, yessireebob, I did enjoy the Dance Parade. It’s a keeper. 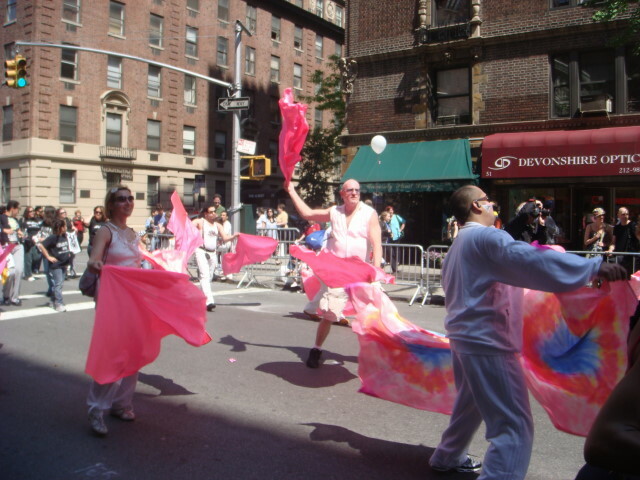 In an odd way, it reminds me of the Persian Day Parade. The first time I saw it, the streets were pretty empty of viewers. But this year, it was jammed big time. 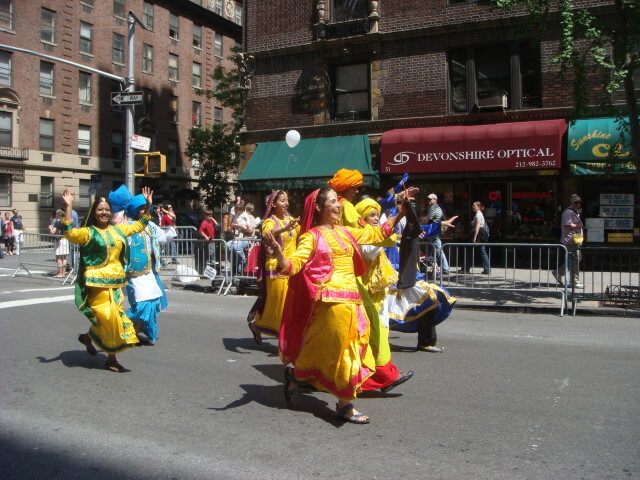 And a jampacked parade creates a buzz and excitement all on its own. Here’s hoping that next year the crowds are huge! 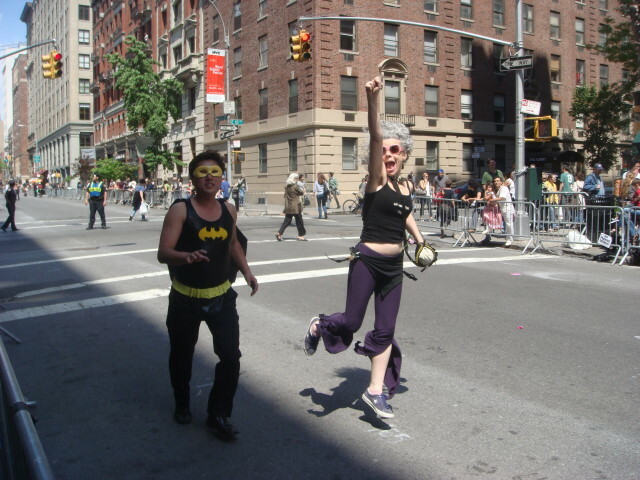 This entry was posted on May 20, 2008 at 6:26 pm and is filed under Events, Greenwich Village, Manhattan, Parades. You can subscribe via RSS 2.0 feed to this post's comments. You can comment below, or link to this permanent URL from your own site.